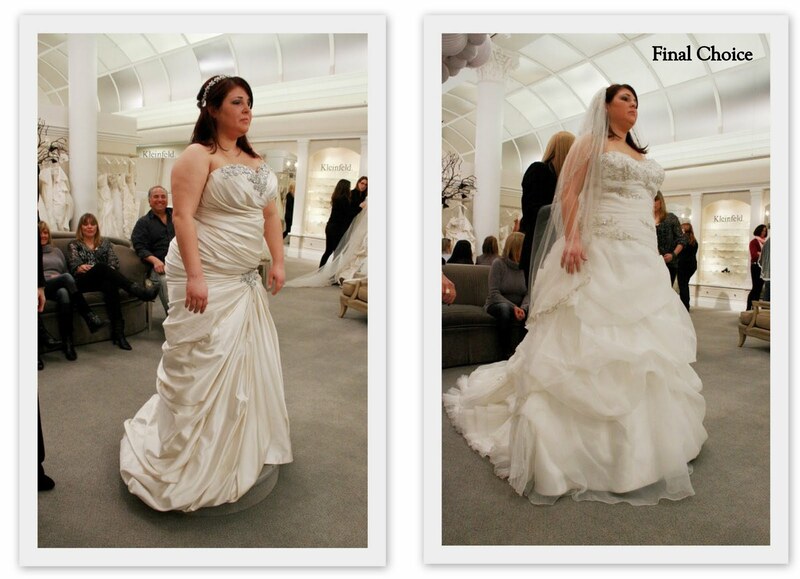 Say Yes to the Dress: Big Bliss...Curvy Style Recap! One of my favorite themes of this week’s episode was the support that I saw from each bride’s family and friends. I have watched many bridal dress shows and sometimes the opinionated family & friends can be more of a distraction than help. Tip #1: Choose the people you bring with you while you hunt for your dress VERY carefully. This is YOUR time and you don’t need any extra added stress from people who think their opinions reign supreme (you know the person I’m talking about). I know there are some people that you can’t leave at home, but this is a great time to work on your diplomacy skills. You can appease the more aggressive opinionated family member by trying on one dress that they suggested. Get it out of the way early, so you can focus on what you are really looking for in a dress. Tip 2: Bigger is not always better. 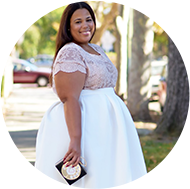 Oh my goodness when I heard ball gown I thought to myself, “EEK!” I don’t want to say that ball gowns are out for the plus size bride, because there are always exceptions to every rule, but a ball gown skirt can be very problematic. Ball gowns are usually very voluminous and can add a lot of bulk to the body. You can become engulfed by this humungous dress, especially if you are petite like Brittany. One thing I liked about Brittany was that she appeased “team mermaid” by trying on a mermaid gown even though she knew it would probably not be best for her body type. By the way, the first gown she tried on had to be probably the hardest to wear for the plus size body. The gathering right underneath the stomach is just an epic fail in my opinion. Even the curvy girl with the flattest stomach still has tummy enough that the brooch and gathering could make her look pregnant. Brittany’s final pick was beautiful and she still had a bit of the princess-y look, but the fit kept her from looking like a cupcake. Tip 3: Fit is always key. It saddened me that Cari was trying to hide her body underneath an A-line skirt. On your wedding day you should be glamorous to say the least. Hiding your body in everyday clothing isn’t flattering and so the same rule should be applied when choosing wedding gowns. You want to accentuate the parts of the body that you like on your wedding day. 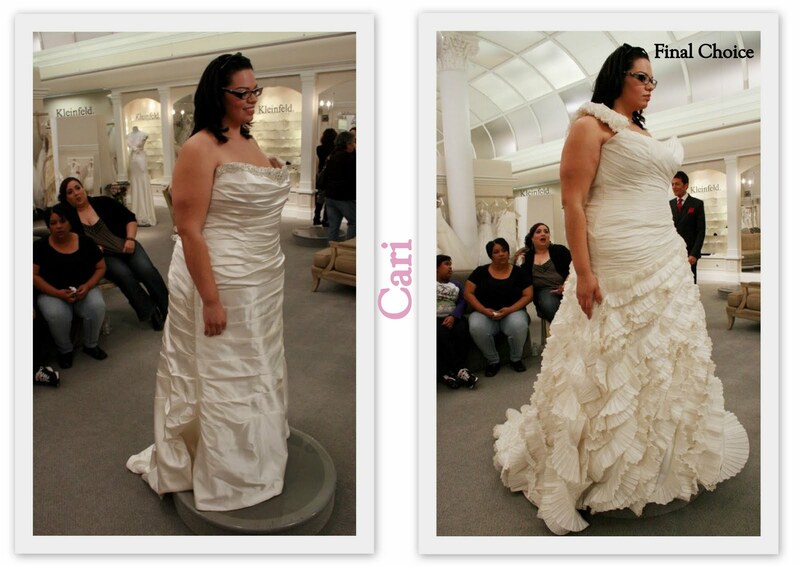 I especially love the shape that Cari gets from the ruching of the gown. Ruching smoothes and can help to create a curvy silhouette. 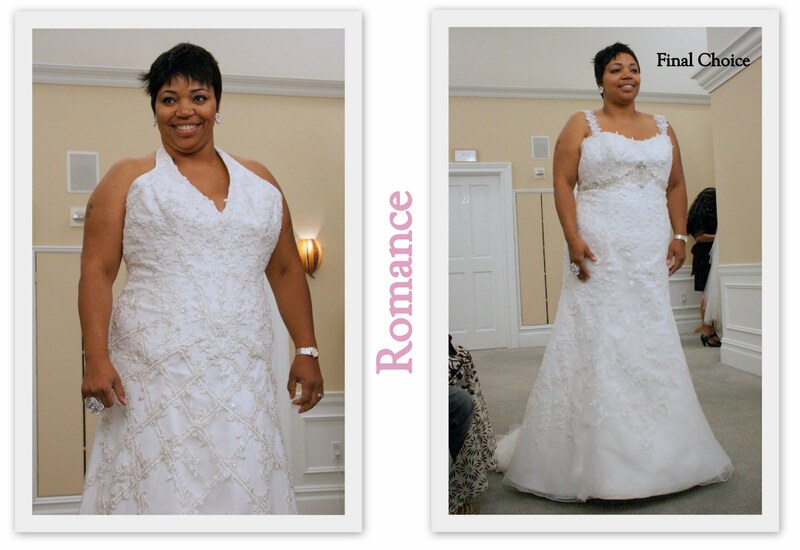 “Romance wants to find a gown that will "knocks her fiancé's socks off." Tip 4: Wear your hair similar to the fitting. When searching for such an important dress you should come to the fitting with a similar look. For instance, Romance’s hair was up and short. I assume that her hair was a wig. In her actual wedding photos her hair was up (or off of her neck as well). Romance also showed up with make-up on. She didn’t show up being overly made-up or with this grand updo, but she did set the stage for her look for her actual wedding. Sometimes dresses can look different with different hairstyles & make-up. I’m saying all this to say don’t go searching for your dress looking like you just rolled out of bed. It could distort your own image of yourself in the gown that you try on. As I watched the show it was obvious that the dresses that fit closer to the body were much more flattering on all three ladies. I think one of the best ways to pick out what kind of style dress will look best on you is to think about your favorite outfits, especially your dresses, and why they work for you and your body type. Married gals, engaged ladies, and any girl thinking about purchasing a wedding dress: Share your tips that you used or will use when you pick(ed) out your wedding gowns for the big day. I watched this episode too and I couldn't believe the first girl's uncle said she looked like a sausage! Def not something you should say if you're on tv even if you're the "outspoken uncle." Anyhow, I loved her final pick! Lololol yes he was wrong. I definitely have rude family members that offer brutal honesty without being asked for an assessment....ahhh family. This is the reason I ordered my dress off of eBay! lol! didn't want my MIL to go with me lol! What a great recap! I try to avoid those shows so I don't get the "shopping" bug again. I watched this episode and I love the choices they picked. Especially Carli. Too bad I can't go to NY to try on those dresses!...More shops should cater to a variety of sizes! i love this post! didn't know the show! seems really interesting! YEA!!!!!! you found a dress. I know how hard that is.This is great article. I will be selling my wedding dress at Navahscloset.com in the coming weeks. I just wanted to share my dress with anohter curvy girl. I love the dress Romance chose for her wedding gown. Does anyone know who the designer is? I would buy this dress for myself in a heartbeat! I loved loved loved the 2nd dress Brittany tried on does anyone know the designers name? ?